You will find bright green salsa verde in almost all Mexican restaurants. It’s sometimes served with your starter basket of tortilla chips or at least it’s out on the condiment table along with the hotter red chile sauce and the fresh tomato salsa. Salsa verde is the one that most Americans never even try when they’re in a Mexican restaurant. Usually most go for the fiery red version or the fresh tomato “salsa fresca.” I used to be in that group. 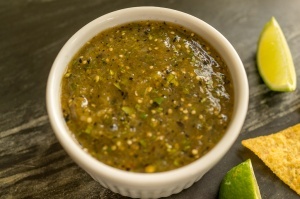 A while back I had the opportunity to try roasted salsa verde and loved the tangy rich flavor. I learned that there are three different methods of preparing this salsa: roasted, raw and boiled. I began testing the three different methods to come up with my favorite recipe for making salsa verde and, of course, varying the ingredients along the way to my own liking. Roasted salsa verde has so much depth of flavor. The raw version is fresh and citrusy. And the boiled version is delicious but very mild and I would have said has incredible flavor, had I not tried the other two first. In case you haven’t already guessed, the roasted version came out my favorite. As with many things, roasting brings out the caramel sweetness and adds another whole dimension of flavor. I recommend trying all three versions to see which turns out to be the most popular at your house. Remove paper husk and wash off sticky coating from tomatillos. Turn broiler on and heat oven for 10 - 15 minutes. Place the tomatillos, onion, garlic and serrano chile peppers on baking sheet lined with aluminum foil. Place baking sheet in oven on middle rack and broil for 7 - 8 minutes. Remove baking sheet and turn garlic and serrano chile peppers over and return to oven to another 7 - 8 minutes. Put tomatillos, onion, garlic, serrano chile peppers, salt, lime juice and agave in a food processor and blend until very smooth. Add cilantro and pulse a few times until well combined. Store salsa in refrigerator until ready to serve. Remove paper husk and wash off sticky coating from tomatillos. Place tomatillos, onion, garlic, serrano chile peppers, salt, lime juice & agave in a food processor. Remove paper husk and wash off sticky coating from tomatillos. Place tomatillos, onion, garlic and serrano chile peppers in a medium pot and cover with cold water. Bring liquid to a boil, reduce heat and simmer for 8 minutes. Remove from liquid and set a side to cool. Place tomatillos, onion, garlic, serrano chile peppers, salt, lime juice and agave in a food processor.